‘Anger’, ‘disenchantment’ and ‘pride’ are three words that perfectly sum up the mood in southeastern Ukraine at the moment. However, there is one thing the majority of citizens in this region crave more than anything – a referendum on their future. RT’s documentary channel shows footage never seen on television looking at the reaction of residents living in eastern Ukraine, to see how they have been affected since the coup-appointed government took power in Kiev. “We are not separatists, we are not radicals. I live in Kharkov and I am 61 and want to understand what country I live in,” said one local resident. “When are they going to stop calling us separatists? We get up each morning and start greeting each other, ‘hello I’m a separatist’, ‘hello, I’m a terrorist,’” said a women living in Lugansk. Residents in the east of the country are ready for the long haul. They have local support and have begun to fortify positions around cities and towns, in preparation for expected attacks from forces loyal to Kiev. However, many hope it won’t come to this. “We are all Slavs. We have to live in peace. We are brothers and we should not fight each other. Our home is Russia,” said a group of men aged around 50. “How is it possible to listen to that so-called government from Kiev who gave orders today to kill their own people in Slavyansk,” they continued. 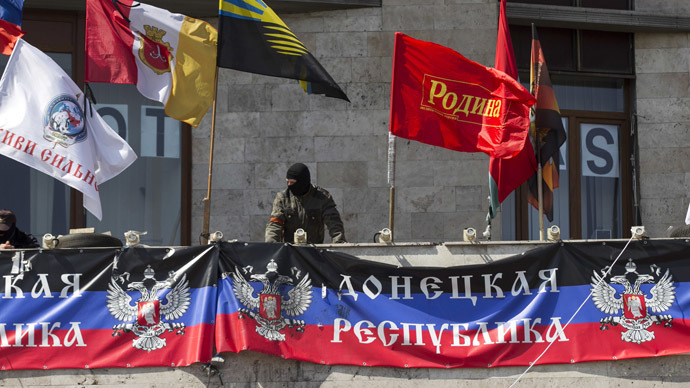 Slavyansk has been the stronghold of the anti-Kiev uprising. Just a few months ago, it was just another town in the Donetsk region, which is the industrial heartland of the country. However, since the coup-installed government came to power and ousted President Viktor Yanokovich, who was born just over 100 kilometers away in Enakievo, things have been very different in the city, with anti-government sentiment growing by the day. “Both my grandfathers were killed in World War II. I will never sing ‘Glory to Ukraine’ or ‘Glory to Bandera’. I hope they get the message,” said a middle-aged man in Slavyansk. The vast majority of anti-Kiev protestors are unarmed. They carry baseball bats and wear military fatigues, but few have weapons and guns like the forces loyal to the coup-installed government. “Dmitry Yarosh, who is the head of theRight Sectoris assembling a hit squad called ‘Donbass’. Once it is assembled, he is going to target us. We are just unarmed people who are trying to protect our legitimate interests,” said another local resident in Slavyansk. The documentary shows how difficult it has become for some Russian-speaking Ukrainians to live in their own country. People are stopped in the street and beaten or arrested just for wearing a St. George ribbon, to commemorate those who were killed in the Second World War. While groups of ultra nationalist and radical groups roam the streets spreading fueling and stoking tension. “There is no difference between us, except we don’t speak Ukrainian. Why do they hate their own people so much? Where does all this bitterness and hatred come from?” a women, almost brought to tears, said. It is difficult for local residents of southeastern Ukraine to understand that their own country is trying to attack them, just because they have different viewpoints. Contact with soldiers loyal to Kiev is common and some of the troops understand the pro-Russian Ukrainians’ predicament. There is a sense of lawlessness in the country, with those in the south east feeling particularly vulnerable. Those living in cities like Dnepropetrovsk and Odessa feel they have no protection from the police against attacks by Ukrainian Right Sector radicals. 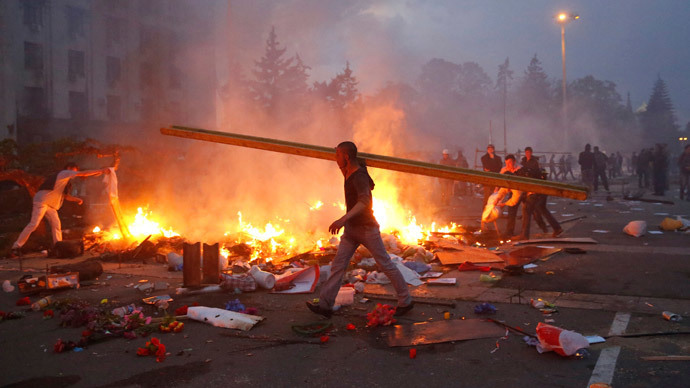 A referendum and an exit from control by Kiev seems like the only viable option.